Catching up with my pilates journey… – Living life the MegaSpecial way! On the 17th February 2016 I will have been practicing pilates for a whole year! * To perform my best I had to position myself at the front of the class close to the instructor. * Being at the front not only meant I couldn’t hide from the instructor, it also meant I would be seeing all of my reflection in the mirror! * Acceptance of the image looking back at me in the mirror and not being able to hide from it! * To trust myself more! That might not make sense unless you’ve taken Pilates before! Let me explain… trusting yourself is key when it comes to balancing in Pilates, trusting myself just a little bit more and I might be able to push myself more. * I am now more aware of my muscles and using them correctly especially when walking! * See my abdominal muscles take form! Something I had never dreamt of! * It’s all about the core! * It hurts my back A LOT if I forget to use my core muscles correctly when doing back work! * I have found my passion! Today’s class was so different to any I have been in before. I felt totally on form which I wasn’t expecting, especially after forgetting to take my Modafinil yesterday afternoon! A lovely thing from today’s class was what the instructor wrote on my Facebook post I shared about forgetting to take my medication last night and how it effected me. It’s great to know that all my hard work is paying off! The other thing about today’s class was that it was recorded! Yes, recorded! A member of staff from the leisure centre asked before the class started if she could record parts of the class. Everyone was asked if they were happy to be in the recording, as if I would say no to that! Thinking about it now, I really hope I don’t look terrible! It will be interesting to see how well I executed the moves! 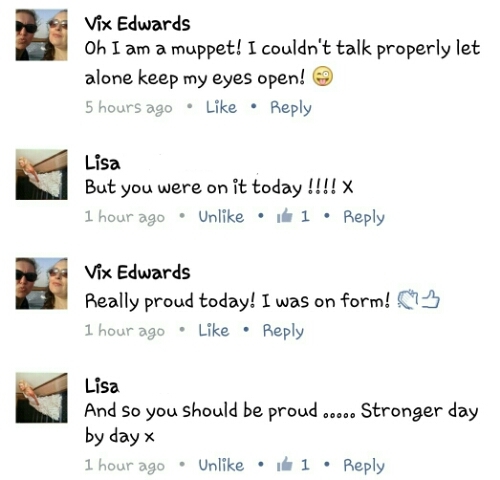 I’m staying optimistic with that comment, surly Lisa would have corrected me if I’d have been awful! Here’s some visuals of how I’m sure I looked today, after all, I was on form and I am getting stronger day by day! Okay, maybe not that strong but I gave it my upmost! When I heard that Lisa also does 1-1 Pilates classes I was really intrigued, then when Lisa told me that she comes to your home I booked straight away! My 1-1 class is tomorrow! I think Lisa knows me well enough now to know that I’m feeling slightly nervous! No point hiding it… I couldn’t even if I tried! I’ve either done something very crazy or very clever here with this! *Christine Robinson, (AKA Crispie) for letting me come with you to your Pilates class for my first lesson! *Kate King, my first instructor. Thank you for being so wonderfully understanding and encouraging! Still miss your classes! * Hannah Bailey, your energy and enthusiasm inspires me! You have such a zest for life! *Lisa Perry, you truly are one in a million! Only you could bring so much humour to a pilates class! Dedication & determination = Vix!